Translation is often asked to be a silent art, an art so subtle that the reader never even sees a ripple in the translator’s wake. 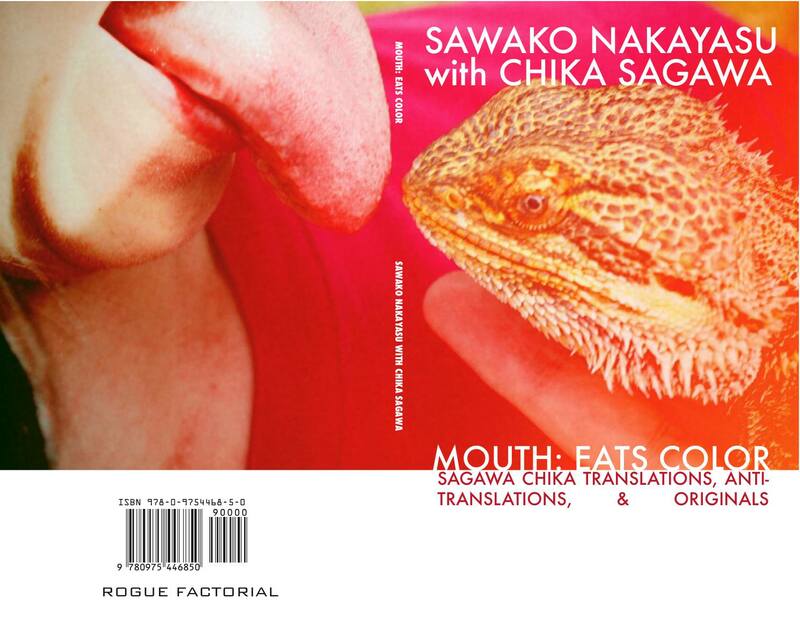 The translator is asked to tread softly, to follow an arbitrary measure of “accuracy” or “faithfulness.” This is precisely why Sawako Nakayasu’s Mouth: Eats Color: Sagawa Chika Translations, Anti-translations, & Originals is so brilliant. Within these pages, Nakayasu is at once invisible and intensely present, creating not a translation that masquerades as a stand-in for the original, but rather a translation that works to create new and exciting pieces that coexist alongside the original poetry. From the opening page, it is immediately obvious that Nakayasu approaches her work with a playfulness often lost in the solemn sphere of literary translation. The first poem, “Promenade,” opens with a mix of English and Japanese: “季節は手袋はめかへ/ Seasons change their gloves/ in/ 報道を埋める花びらの fading/ afternoon薄れひの/ 午後三時light.” For a reader who is not fluent in Japanese, it is never obvious throughout the book what is a translation, what is a repetition, and what is not even in the original poem at all. Poems, unless they are by outside contributors, are never marked as belonging to Sagawa or Nakayasu; they belong to both and neither at once. In addition to the mixed English and Japanese throughout, the further addition of French blatantly straddles the lines of language and culture to remind the reader that Sagawa was herself influenced by European modernism and was unafraid to use loanwords in her work. Even a reader who can read both languages would be hard-pressed to make sense of this without access to the previous translations within Mouth Eats Color. And this is perhaps both the genius and downfall of the book. For someone who is fluent in only English or only Japanese, only half of the book is accessible, and only half of the workmanship at hand visible. However, this, I would argue, is Nakayasu’s point. By playing with translation, by making her own presence blatantly obvious on the page, she is reminding the reader that translation can never be approached as though it were an original text, even though this is so often the case in scholarship and publishing. When we praise the rhythm of a line or the crisp image of a passage, we must remember that those pleasing syllables and clear metaphors are coming to us through the filter of the translator, and the invisible translator is not supposed to remind us of that fact. By playing, by being overt in her play, however, Nakayasu reminds the reader not only that the original exists, but that the translation itself is a work of art to be respected for its craftsmanship and innovation. The act of decoding the translation, the act of understanding how the translator worked to shape her work, is in itself another aspect of the text and one which is proudly displayed in Mouth Eats Color. Laurel Taylor is an MFA candidate and Iowa Arts Fellow in literary translation at the University of Iowa. She translates from the Japanese.